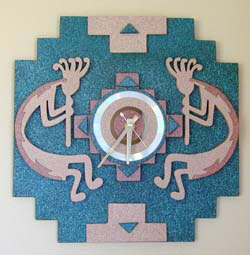 If you love the Southwest and all things Kokopelli, you'll adore this unique Twin Kokopelli Pendulum Clock or Wall Clock (featured below). You could look far and wide before finding another timepiece like this. It's perfect for sitting atop your mantle or anyplace you want to showcase it. Hand constructed of wood and sprayed with stone-textured paint, the clock features quartz movement and has a CD as it's face!